Predio Son Quint extra virgin olive oil is a quality product from the island of Majorca, Balearic Islands, Spain. It is manually and caringly produced by Luis Español using methods respectful of the fruit and the earth. The result is a tasty and fruity olive oil, with green and herbaceous notes. The oil is obtained from a coupage of three types of olives native to the island: arbequina, picual and empeltre. 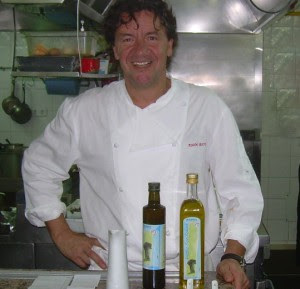 Predio Son Quint is gaining great acceptance and use by well-known culinary personalities such as Koldo Royo. Last week, we tasted delicious creations by chef Koldo made with Predio Son Quint. If you check some websides about olive oil in Mallorca we can see that this cooker recomend all of oils from Mallorca.